Ryerson’s Nutrition and Exercise Testing (NExT) Lab can show you how long it takes to burn off dessert. Its high-tech fitness equipment tests your health and withholds no information. Located in Kerr Hall, the NExT Lab has several pieces of equipment that measure a person’s health by testing fitness, body composition and energy expenditure. Since August 2014, the lab has used the equipment in its research on the effects of dietary protein on appetite and energy expenditure in children with disabilities. It also tests the fitness of some Ryerson athletes. They charge the public for fitness tests then use the profits to employ students as research assistants, maintain lab equipment and fund new research. “We use [paid testing] as a cost-recovery mechanism. It allows us to pay our research assistants. 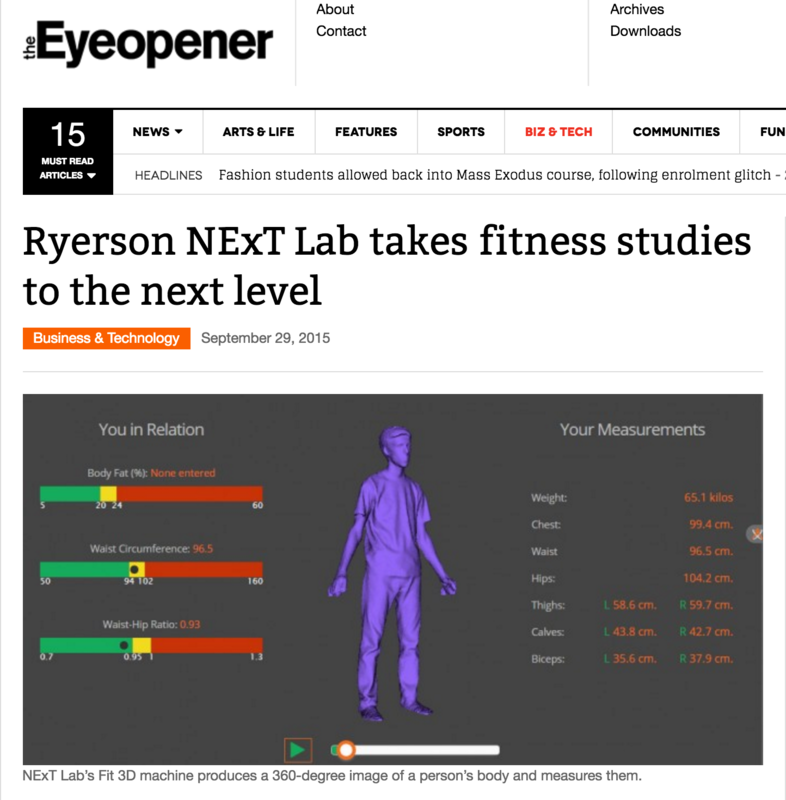 We are able to buy small strategic pieces of equipment and [pay for] the upkeep of that equipment as well,” said Nick Bellissimo, Ryerson nutrition professor and director of the NExT Lab. He said profits also go toward funding new research projects. The lab employs about 10 students as research assistants, Bellissimo said. In January, the NExT Lab started selling tests to the public. The lab charges discounted rates to seniors, students, Ryerson staff and Ryerson alumni. Lab manager and third-year nutrition student Vincent Wong said the tests provide people with numbers that are useful in evaluating one’s health. Over 150 people have paid to take tests at the NExT Lab, Wong said. About 30 Ryerson students have paid to be tested. Most took the $50 Bod Pod test, which measures body composition — the amounts of fat, bone, water and muscle in one’s body. “I think the reason why they just want to do the Bod Pod is because other tests are kind of expensive,” said Wong. The lab’s student prices range from $30 to $750, depending on the test. The lab’s full-price testing rates range from $50 to $1,000. For $40, students can be scanned by the lab’s Fit 3D machine, which produces a 360-degree image of a person’s body and measures them. For $750, a student can take a week-long test in which a pedometer-like device measures their daily energy use. This test, called the Total Daily Energy Expenditure (TDEE), measures the number of calories a person burns per day while resting, while digesting food and the amount of energy a person expends while exercising in a day. The TDEE costs $1,000 for a member of the general public to take. Wong said the student prices cannot be lowered because the lab barely profits from them. The student and senior rate is “as close to cost as possible,” said Bellissimo. The lab only makes a $10 profit when a student takes the Bod Pod test once the cost of a research assistant ($20 to $25 per hour) and the cost of wear and tear on the $50,000 Bod Pod machine are factored in. “What we’re hoping to do is have a research study where students can access these tests [and] we won’t have to charge them,” he said. Undergraduate students in the Nutrition Discovery Labs, the facility where NExT Labs is based, work as researchers and lab technicians. High-level positions are usually reserved for graduate students. Wong began working with Bellissimo two years ago when he heard about the professor’s research surrounding childhood obesity. He began as a volunteer and worked his way toward a paid position. Bellissimo said that happens to other students who work at the NExT Lab. Bellissimo said he would love a mobile NExT Lab. With it, his team could visit schools and collect important data on children easier than it can now. Currently, the lab can only test children when they are not in school. A mobile lab “would be a major achievement for us,” Bellissimo said.